Scammers spare no incident to target as many victims as possible, and this time they are exploiting the tragic death of comic actor Robin Williams by offering the fake Facebook videos proclaiming a Goodbye video message that Williams made before his death. 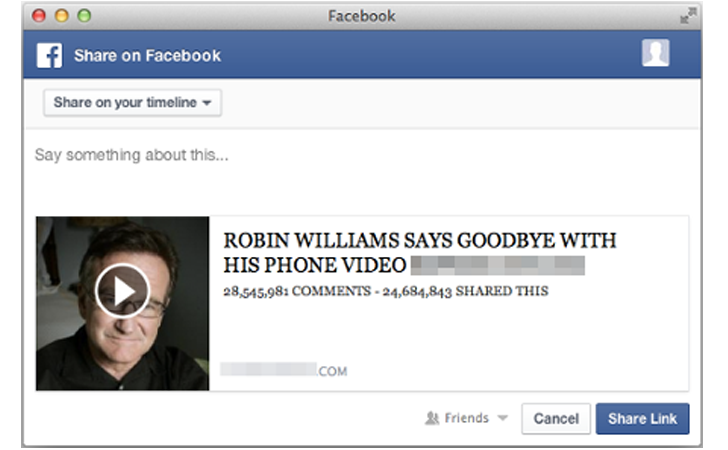 According to Symantec, this fake Facebook post, which you may see on your walls shared by your Facebook friends, was created by scammers looking to profit on the actor’s death. The bogus post claims to be a Goodbye video of Robin Williams making his last phone call before committing suicide earlier this week. Scammers and cyber criminals often use major headline news stories to lure in victims. You may fall victim to this video as the news claims to have come from the most popular and reputed BBC News website. “There is no video. Users that click on the link to the supposed video are taken to a fake BBC News website. As with many social scams, users are required to perform actions before they can view the content. In this case, users are instructed to share the video on Facebook before watching,” Symantec security response manager Satnam Narang said in a blog post. When you fill out the survey, it generates revenue for the scammers for every answered surveys and file downloads. According to Symantec, the scam started within 48 hours after the news broke out about Williams’ death and the video has been shared over 24 million times on Facebook. Scammers have used simple social engineering trick – the technical term for manipulating people into clicking malicious links – in order to infect large Facebook users. “Over the years, scammers have used both real and fake celebrity deaths as a way to convince users to click on links and perform actions. From Amy Winehouse and Paul Walker to the fake deaths of Miley Cyrus and Will Smith, scammers are opportunistic and always looking for ways to capitalize,” Narang said. One example of it is the incident when the former “Saturday Night Live” and “30 Rock” star Tracy Morgan was critically hurt in a six-vehicle fatal accident on the New Jersey Turnpike, that was announced dead by the scammers. Symantec advised the Internet users to be “vigilant and skeptical” when reading sensational stories on social media websites. They have also alerted Facebook about the scam campaign and they are taking steps to block it. The Better Business Bureau (BBB) has also issued a warning about the similar scam. ”Basically someone clicks on a link to view information or video about Williams, but instead it tells you to download a player, which is really a virus,” it said. Don’t take the bait. Stay away from promotions of ‘exclusive,’ ‘shocking’ or ‘sensational’ footage. If it sounds too outlandish to be true, it is probably a scam. Hover over a link to see its true destination. Before you click, mouse over the link to see where it will take you. Don’t click on links leading to unfamiliar websites. Don’t trust your friends online. It might not actually be your friends who are liking or sharing scam links to photos. Their account may have been hacked and scammers could be using another tactic called clickjacking. Clickjacking is a technique that scammers use to trick you into clicking on social media links that you would not usually click on.